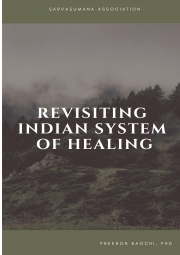 Description of "REVISITING INDIAN SYSTEM OF HEALING"
Revisiting Indian System of Healing is an innovative approach to provide a modern thought to ancient Indian system of medicine viz, Ayurveda/Siddha/Unani and Yoga. The healing via Psychology, Counseling, Ayurveda and Yoga including Astrology and Past Life Regression Therapy is highlighted here in this work. The book can be used as reference book by the scholars pursing research in Indian system of medicine. Dr. Preenon Bagchi is attached with University of Lorraine, Nancy, France as Post Doctoral Researcher. He has completed PDF under Science & Engineering Research Board, Government of India. He has done his doctorate from Career Point University, Kota, Rajasthan, India (2016). He holds certification in Ayurveda, Yoga & Sanskrit. During his doctoral research he had attended IBRO sponsored Advanced School of Neuroscience at Monash University, Malaysia. He has authored over 50 research & review papers in several national & international journals & in conference proceedings presented his research works in conferences abroad. He has guided several graduate students. He is an Editorial Board Member of International Journal of Public Mental Health & Neurosciences, The International Journal of Psychosocial and Cultural Genomics, Consciousness & Health Research and Neuroscience Research Letters. Reviews of "REVISITING INDIAN SYSTEM OF HEALING"